Hello again my friends, It certainly has been quite an age since my last post (which was before San Diego Comic Con). Unfortunately, I have been a busy bee, as I have vacated my school, my apartment and the state of Illinois. Currently reside in the distant country in South Carolina, where I will remain for an unspecified amount of time. Additionally, I had a bout of Appendicitis, which required quite a bit of recovery, but alas, all is well now. In my absence, I feel I have neglected you, my dear readers. But fret not, for I will not be doing anymore of that! 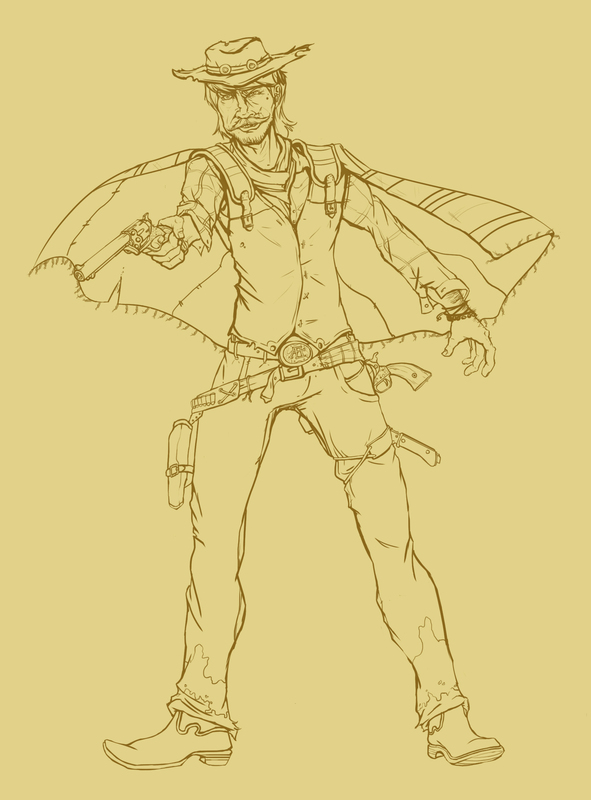 For your viewing pleasure, I present my current WIP, a character study of “The Shot of the West”, the co-protagonist in an upcoming western comic “Frontier”. Additional WIP include “Off the Clock” which has received scripting and some rough work laid out, I hope to have that working shortly and on a regular basis. I am also working on the previously posted piece (Sword of the North…no relation to the Shot). I am also working hard on a project for my nieces soccer team, which I will likely post tomorrow or so. Anyway, my beloved readers, more will be coming in the next few days, slow but steady.